The Mountain Equipment Couloir Glove is a rugged glove, excelling in most situations where durability and weather resistance are the key requirements. It features a cowhide leather palm and fingers, this makes the Couloir Glove more abrasion resistant than most soft shell / nylon gloves featuring just a central leather palm. Whilst this added durability of the fabric should make them last longer Mountain Equipment have chosen to place seams just below the finger tips on both the front and back of the hand; effectively creating a weak point (for both durability and weather resistance) and adding bulk which in turn compromises dexterity. 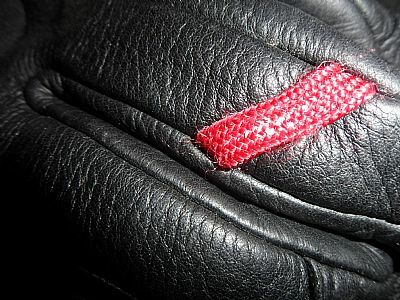 Similarly on the back of the hand the seam (between the leather and the nylon) crosses the knuckles – for climbing and most uses this seam would be better placed further up the back of the hand, alleviating a wear point and providing better back of the knuckle protection. The Gore-Tex XCR waterproof insert in conjunction with the leather palm and fingers (remembering to proof it) helps to keep even damp snow at bay for longer than almost anything else available (excluding waterproof mitts). The Gore-Tex XCR insert does however compromise the breathability of the Mountain Equipment Couloir Glove – something to anticipate when working hard to avoid getting damp gloves from perspiration. Leather palm and fingers provide outstanding durability. Gore-Tex XCR insert and leather outer keep hands drier for longer in damp snow. Extended cuff with cinch cord help keep wrists and subsequently hands far warmer. Fibre pile and fleece lining work well to wick moisture away and do make gloves easier to get on and off. Seam locations could be better placed for durability, weather resistance and dexterity. Soft nose wipe on upper thumb is a major weakness for durability (See Mountain Equipment Randonee Glove Review). The Mountain Equipment Couloir Glove is a fantastic durable glove, offering good levels of warmth for a very usable level of dexterity. Arguably best suited to “working in snow”, e.g. digging, handling equipment, saving more dextrous gloves for climbing and mitts for whilst stationary.